35 or under? The FlexPass offers you an upgraded theatre experience like never before! 4 tickets to use anytime, for any show, in any combo you want. Discounts to local restaurants, parking, and extra deals. Early access to TimeLine’s Backstory magazine, a behind-the-scenes look at the history behind each show. A MyLine Concierge to help you book your tickets and any questions you may have. You don’t even have to be a current MyLine member to get a MyLine FlexPass – anyone age 18-35 who purchases a FlexPass will then be enrolled in the MyLine program! 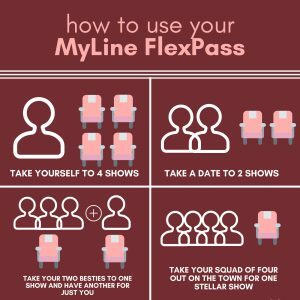 With all the perks and flexibility, the MyLine FlexPass is the best way to take in the TimeLine experience. PURCHASE YOUR FLEXPASS ONLINE or call the box office at (773) 281.8463 x6 with your payment information. 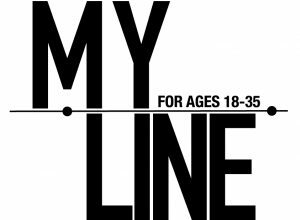 If you are not currently enrolled in the MyLine program upon purchase, you will be officially added as a MyLine member and receive updates on all performances and events exclusive to MyLine members. As a FlexPass holder, you’re eligible! 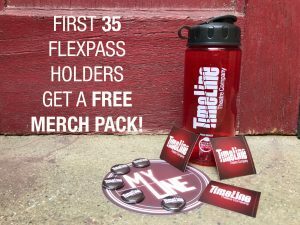 The first 35 new MyLine subscribers will receive an exclusive TimeLine swag pack! You can’t afford NOT to!! Our next season offers four plays all new to Chicago: The previously announced, Tony Award-winning Oslo presented at Broadway In Chicago’s Broadway Playhouse; plus an acclaimed but rarely performed 100-year-old play named one of the best of the 20th Century; a powerful and provocative play described by the playwright as “an expressionistic buzz saw through the contemporary myth that ‘all lives matter;’” and a world premiere developed through TimeLine’s Playwrights Collective. Learn more about our 23rd Season and secure your FlexPass today. FlexPass holders get four tickets to use in any combination, anytime during the 2019-20 season. Reserve in advance to ensure availability. For Oslo at Broadway In Chicago’s Broadway Playhouse, PLEASE NOTE: The Broadway Playhouse has reserved seating. TimeLine FlexPass Subscribers will be asked to choose dates for this production by July 1, 2019 in order to secure best available seating. Seating will be accepted when you select a date. If you have any questions, please do not hesitate to contact the TimeLine Box Office for assistance. FlexPasses and additional tickets purchased online or with a credit card are subject to additional ticketing system fees. To avoid fees, purchase in person using cash or check. The first time you pick up tickets you will be asked to provide an ID card that includes proof of age to validate your MyLine eligibility. Limit one extra ticket per production for $15. All additional tickets are eligible for a $10 discount off full price. Limit two free exchanges per production. As a MyLine FlexPass holder, you are opted in to TimeLine’s MyLine email list, to receive updates about each production, additional offers, special events and more.